For the first time since February 2013, the top-ranked women’s tennis player in the world is not Serena Williams. When Williams reached the second week of the US Open earlier this month, she had in her sights two of the oldest records in the women’s game. Win the tournament, and she would not only surpass Steffi Graf’s haul of 22 Grand Slam singles titles, but would also go ahead of the German in terms of consecutive weeks spent at number one. But it wasn’t to be: against the odds, Williams was dispatched at the semi-final stage in straight sets by tenth seed Karolina Pliskova, and with that went her chances of bettering either of Graf’s records. With Williams’s defeat, Angelique Kerber — winner of the other semi-final — was guaranteed to take over as number one. Fittingly, Kerber went on to beat Pliskova two days later, lifting the champion’s trophy in the knowledge that she was now truly on top the world. Williams has been so dominant over the last three years that the term "number two" has at times suggested a proximity in ability between the top two that was in reality a yawning gulf. But after almost three years of the number two spot changing hands between a series of reluctant owners, Kerber emerged at the start of 2016 as the first real threat to the top spot, defeating Williams in the Australian Open final to win her debut Grand Slam title. 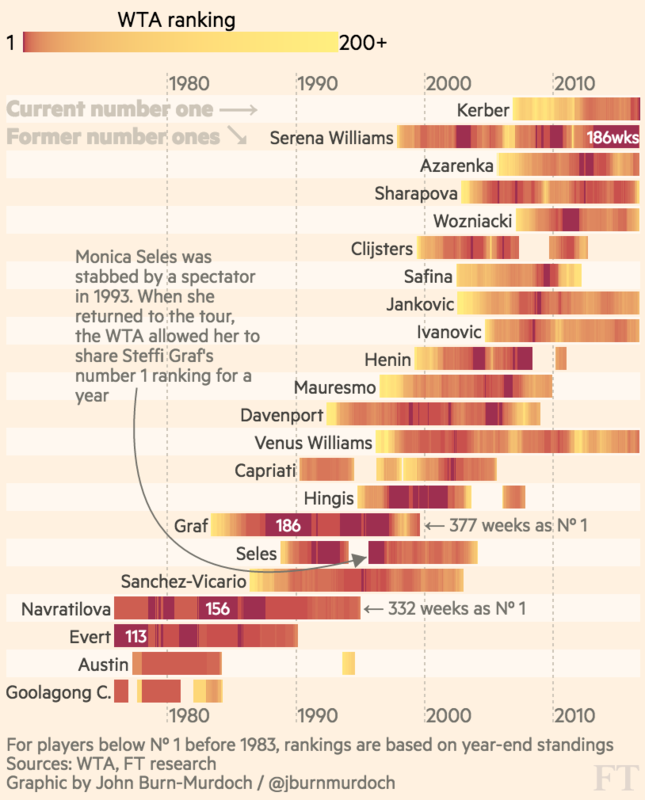 Ten different players have held the number one spot since Williams first topped the rankings aged 20 in 2002 — a mark of her incredible staying power at the top of the game. 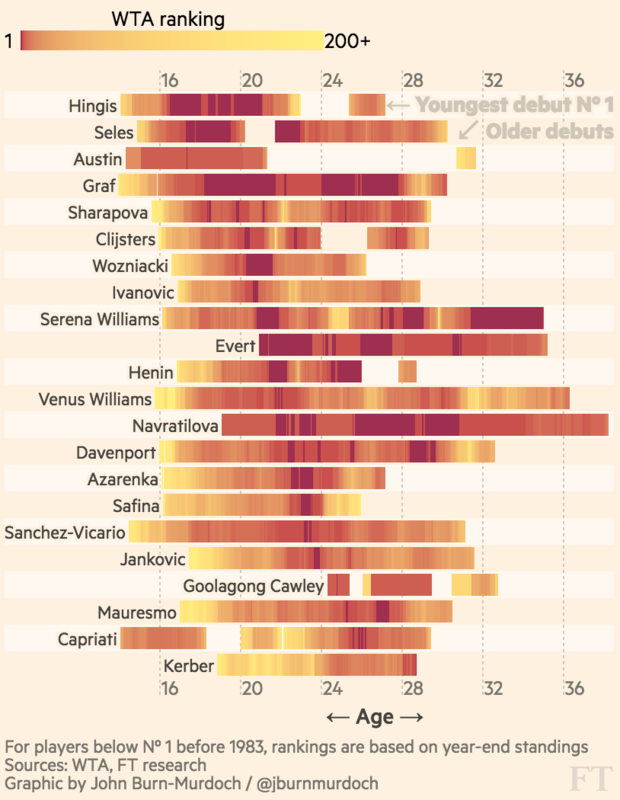 Most of those did so in their early or mid twenties, but Kerber has arrived atop the rankings at 28, in her tenth year of playing the Grand Slams. In fact, Kerber is the oldest ever first-time WTA rankings leader. But although Williams missed out on two chances to make or break long-standing records on the women’s tour, she arguably went one better. Ahead of the tournament, attention was focused on the two Graf statistics, but when Williams defeated Yaroslava Shvedova in the last sixteen of the US Open — two rounds before her eventual elimination — she achieved something that no other man or woman has done in tennis history: a 308th Grand Slam match victory. A win in the next round against Simona Halep made it 309, taking Williams two clear of the next player on the list: Roger Federer. The Swiss veteran is just six weeks her elder, and there may yet be a fascinating indirect rivalry between the pair as they seek to cap off already glittering careers. But in the end the record may go elsewhere. Novak Djokovic has reached 228 wins aged almost a year younger than Federer was upon reaching the same mark, and two years ahead of Williams’s schedule. 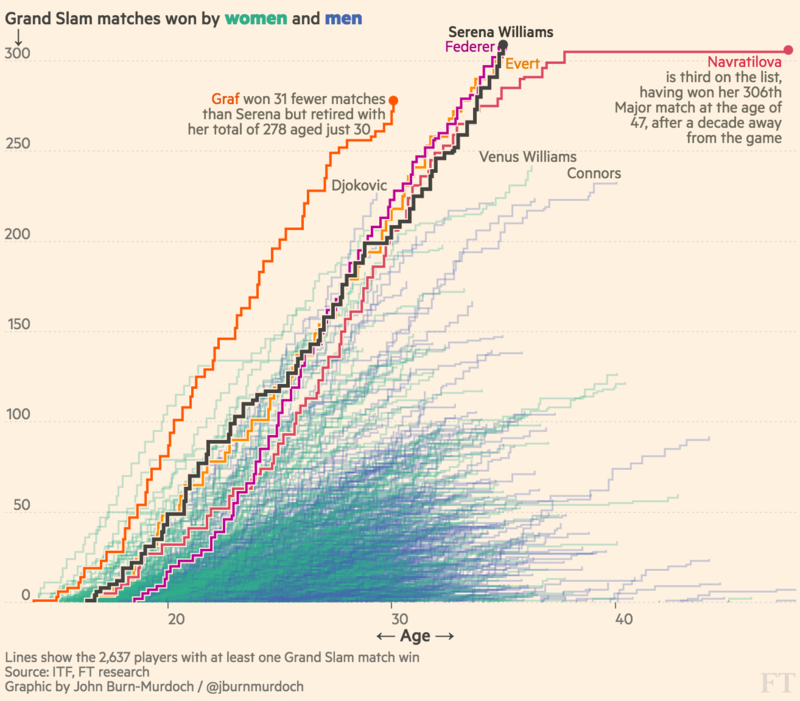 Williams and Federer will both be remembered for their resilience as well their sheer brilliance. 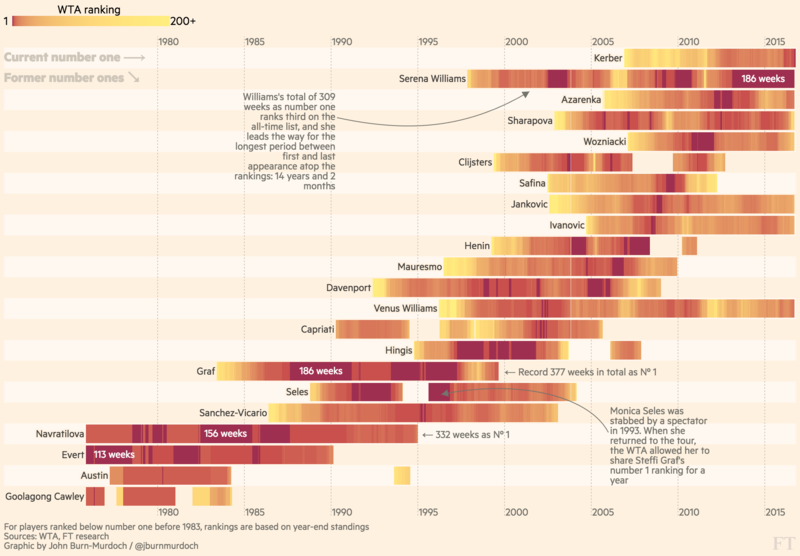 Few other players whose careers began during the open era have played even close to as many Grand Slam matches as they have, though it should be noted that some tournaments — particularly the Australian Open — had smaller draws in the 1970s, and therefore fewer matches on offer. 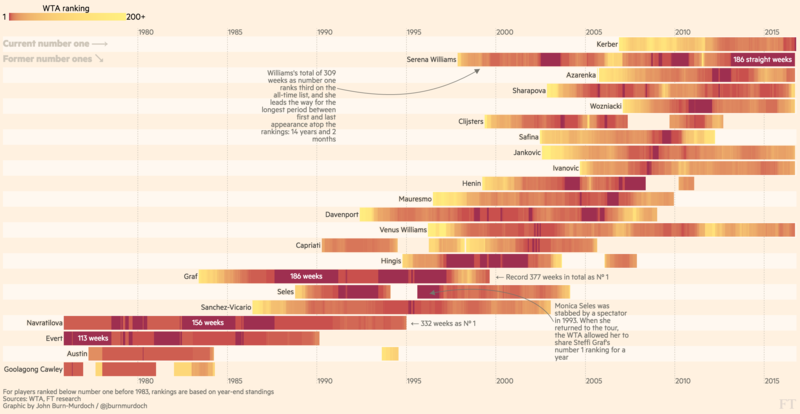 After each had played 291 Grand Slam matches, Williams and Federer were neck-and-neck, each with 252 wins. 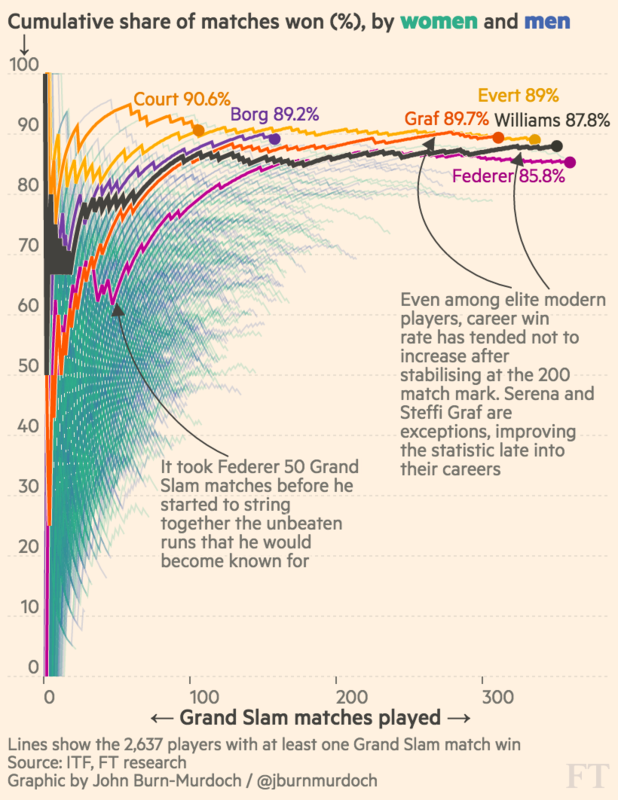 But since then Williams has pulled clear, or Federer has fallen away, depending on how you look at it. The divergence in their records coincides with Djokovic’s emergence as a new dominant force in the men’s game. 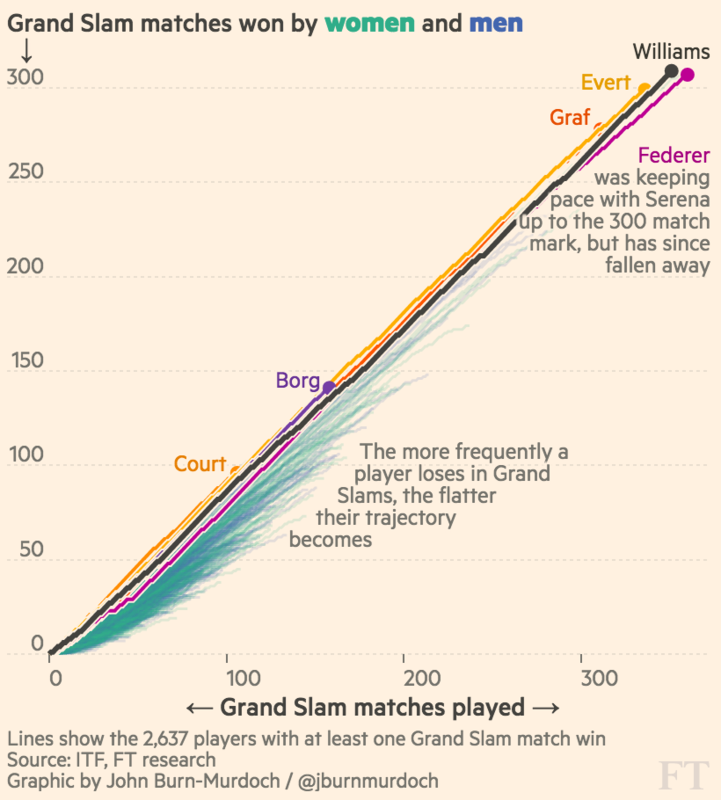 It will be interesting to see whether Kerber’s arrival is what finally puts downward pressure on Williams’s Grand Slam performance trajectory. 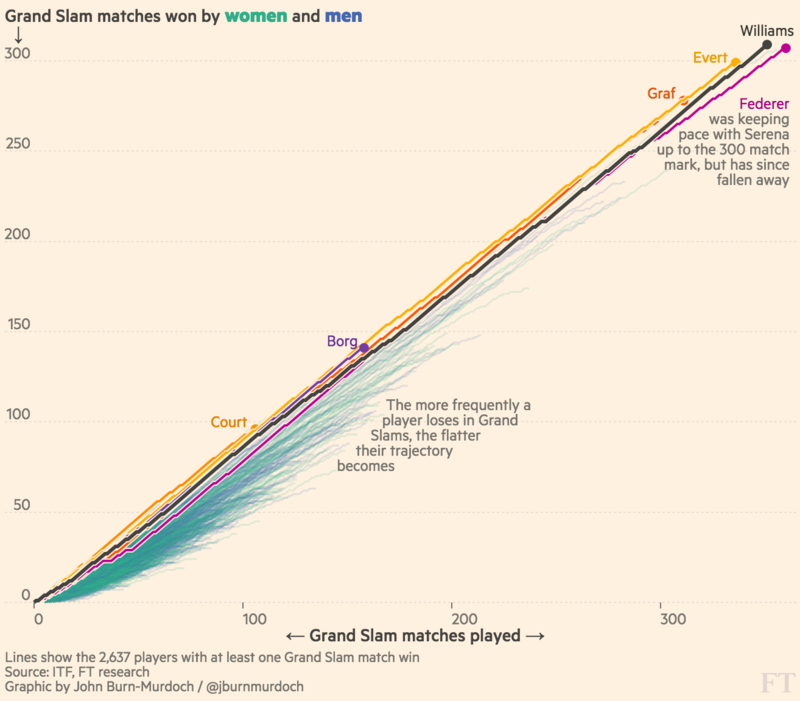 Another way of looking at the same data is to view Grand Slam matches won and lost in terms of a constantly evolving career win rate. Early in their careers, simple mathematics dictates that players’ career win rates jump around, since each win or loss has a large impact while the sample size is small. 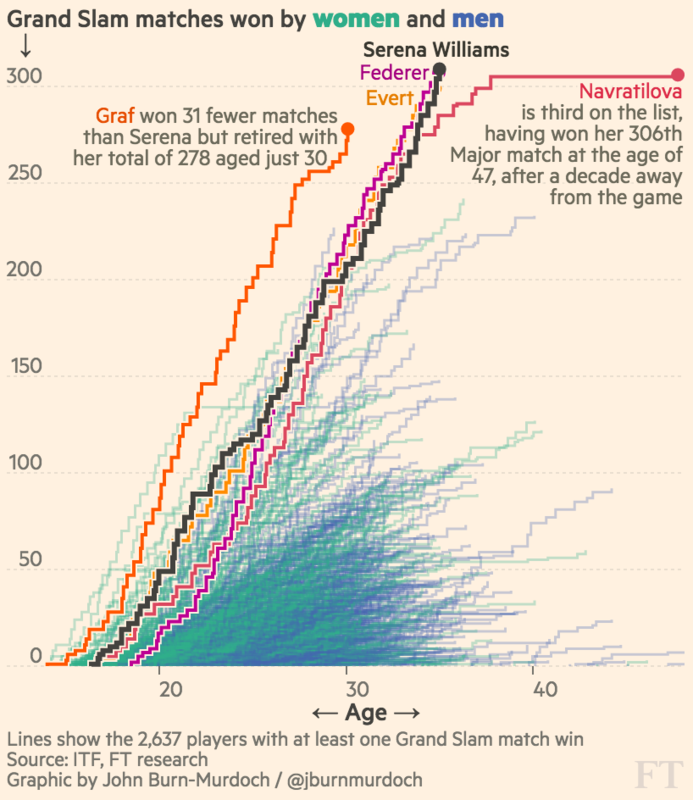 But for those talented and resilient enough to reach 200 matches, rates tend to be stable or in a late-career decline. 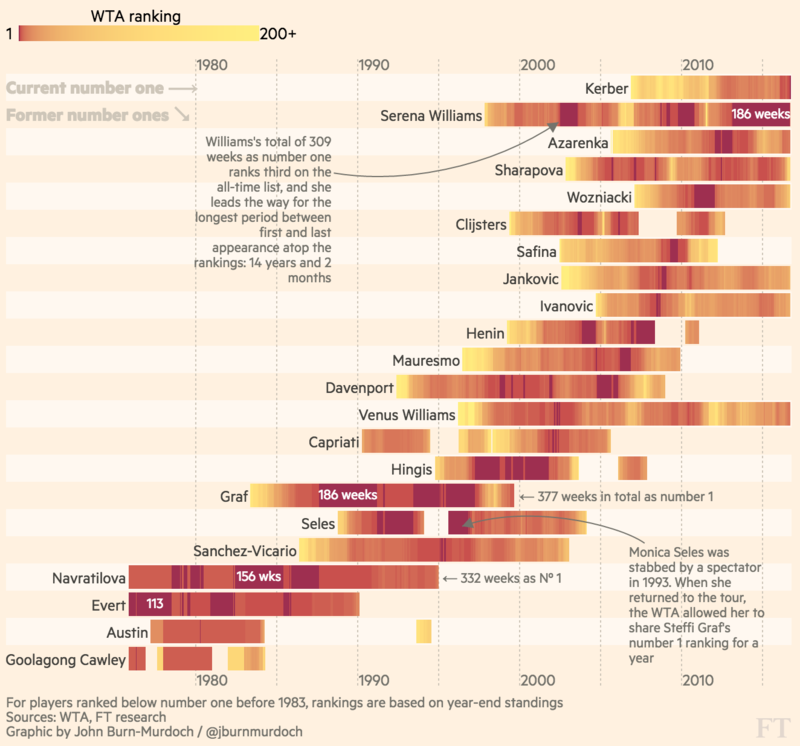 Not Serena: her career win rate has kept rising, climbing from 86 per cent to almost 88 per cent since her 200th match. Williams has the fifth highest Grand Slam singles win rate of all time, but is unlikely to catch Chris Evert who lies in fourth. 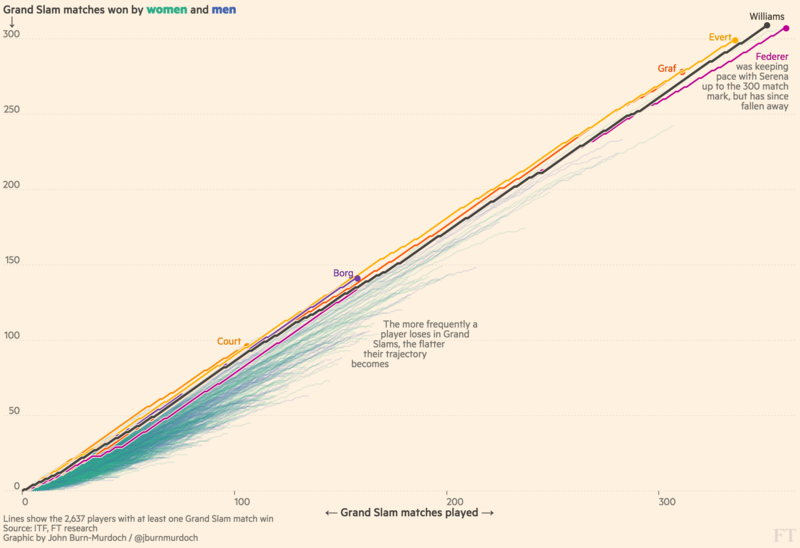 Even a "Calendar Grand Slam" — winning all four major tournaments — in 2017 wouldn't be enough, as the relative impact of each victory on her overall win rate diminishes with every match played. But Williams’s era-defining talent and her endurance as a dominant force while generations of challengers came and went mean her place place as an all-time great is assured, regardless of whether or not she goes on to break Graf’s Grand Slam title record in the future. 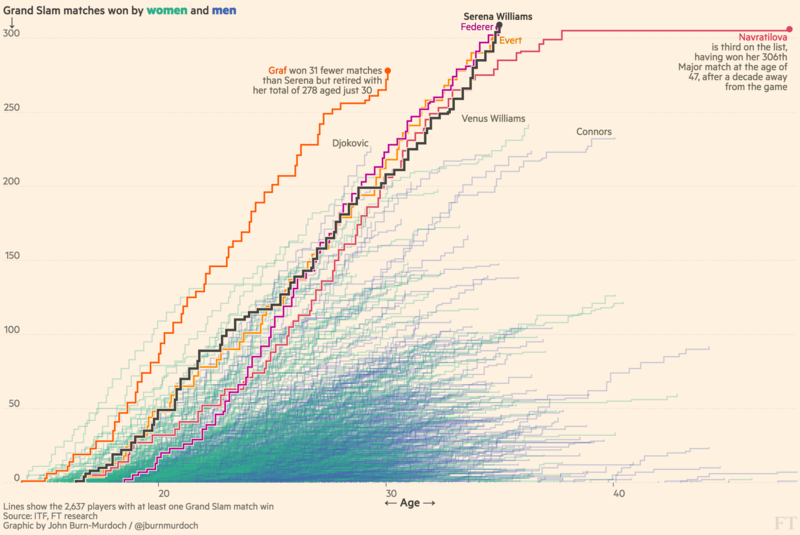 Where would you place Williams among the other greats of both women’s and men’s tennis? Will she go on to beat Graf’s total of 22 majors, or does her loss of top spot signal the beginning of a gradual decline? Let me know in the comments below, by email, or on Twitter. This article has been amended to reflect the fact that Steffi Graf has won 22 Grand Slam titles — the same number as Serena Williams — and not 23 as initially stated.